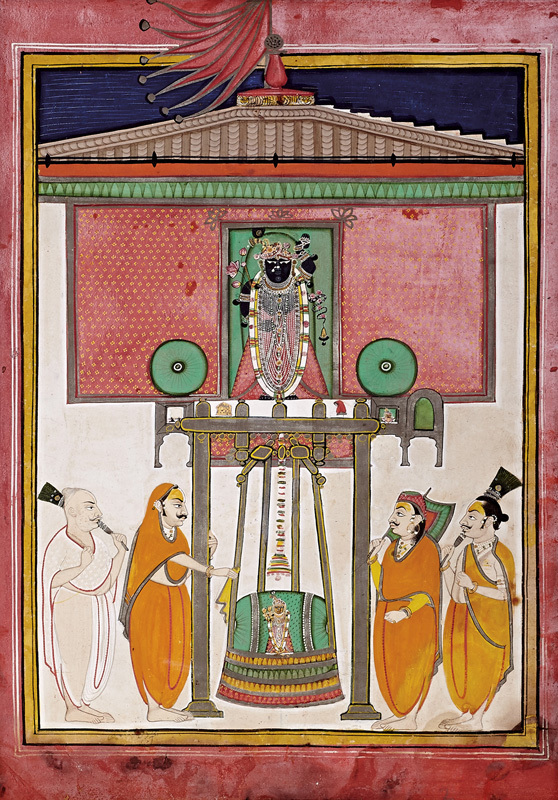 In this painting, Shrinathji bears the shringara of a red pichhoda, an A-line long skirt and a kulhe jod on the shrimastaka- head turban with a peacock feather ornament as bolsters are kept on either side. The image of Madanmohanji is placed near Shrinathji. The section below the swarupa of Shrinathji, Girdharji swings Madanmohanji on a hindola and Govardhanlalji is shown holding a fan. Behind both Girdharji and Govardhanlalji stands another Gossainji holding morchhala.